Global warming induces a brain change and mind change. 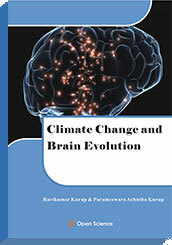 Climate change and global warming can contribute to brain evolution and changes in brain structure. Endosymbiotic archaeal growth is related to global warming and climate change. The archaea contains magnetite and can catabolize cholesterol to generate porphyrins. Digoxin can produce sodium potassium ATPase inhibition and a pumped phonon system acting through dipolar magnetite and porphyrins to generate a Frohlich model of Bose-Einstein condensate. This can produce quantal perception. The archaeal magnetite and porphyrins can produce increased perception of low level of EMF leading onto prefrontal cortex atrophy and cerebellar hypertrophy. This can lead onto neanderthalisation of the brain. This leads onto dominance of cerebellar cognitive function as has been reported earlier from this laboratory. The prefrontal cortex atrophy can lead onto extinction of rationalization and imitation behaviour patterns. This produces a robotic human personality. This can also produce a state of transcendence. This is the basis of surrealism. Climate change induced brain and mind change has devastating consequences.